On March 29, 2018, the partners of the LICM project (Learning about the use of Innovative Communication Methods ) came together in Vientiane for a final review of successes and lessons learnt after a year of joint activities. 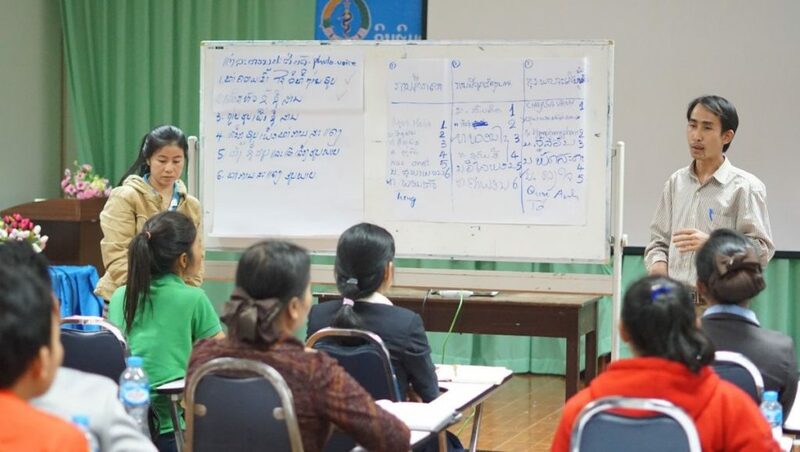 Coordinated by MCNV, this collaborative effort sought to empower vulnerable youth groups in Laos, providing them with skills and means to advocate more effectively for their specific needs. Each implementing partner represented a vulnerable youth group with a particular constituency: Proud to Be Us (representing LGBTQI) , the Lao Disabled People’s Association (disabled youth) and Vientiane Youth Centre (minority youth groups). One of the problems highlighted by this project is that in Laos, the majority of the population (about 60%) is under 25 years old, yet young people rarely have the opportunity to contribute to decisions that are taken about their lives. Practices and policies that could be better informed from more youth participation include those related to the sexual and reproductive health and rights (SRHR) of young people, especially young vulnerable people. To obtain more knowledge about specific SRHR issues of different groups of vulnerable youth in Laos and enable vulnerable youth to learn about and advocate for better SRHR, MCNV in partnership with three Lao organizations decided to implement LICM as an action-research project. This allowed LICM to explore the potential of diverse Innovative Communication Methods such as songs, dance, theatre and participatory video for peer-learning, behavior change and advocacy. Training on Photo Voice carried out by LPDA staff members. This project was funded by Voice, an innovative grant facility that supports the most marginalised and discriminated people in ten low- and lower-middle income countries in Africa and Asia. Aiming to amplify and connect thus far unheard voices in efforts to leave no one behind, this initiative is financed by the Ministry of Foreign Affairs of the Netherlands. LICM also served as co-financing for the MCNV led LEARN Programme (Lao Equity through Policy Analysis and Research Networks) a five year effort to enhance the capabilities of public health institutes in Laos, bringing together a range of partners working in education and health policy for this purpose.